Happy National Dairy Month y’all!! I’ve recently teamed up with America’s Dairy Farm Families & Importers, in partnership with the Innovation Center for U.S. Dairy! Over the next few months, I’m going to be bringing you guys some amazing recipes! I’m talking cheesy mac n cheeses, creamy homemade ice creams, delicious pudding pies and so much more!! Oh, the fun we are about to have!! To kick things off, I’ve got one of my family’s favorite pizza night recipes! My boys are pretty much obsessed with watching those surprise egg videos on YouTube. If you have young kids, chances are you know the ones I’m talking about. The host has a ton of plastic or chocolate eggs, and she cracks them open on camera to reveal a prize inside. Last year I decided to take that same “surprise me” concept to our weekly pizza night. 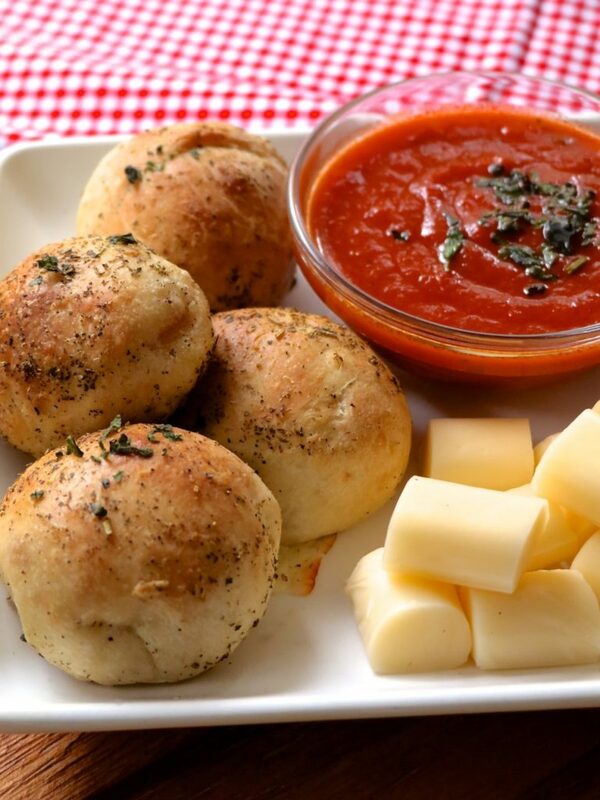 We call this recipe Surprise-Me Cheesy Pizza Bites!! Each pizza bite consists of different pizza topping fillings. It’s truly like having a box of chocolate only with pizza! I can always count on this cheesy meal to bring a smile on my children’s face. 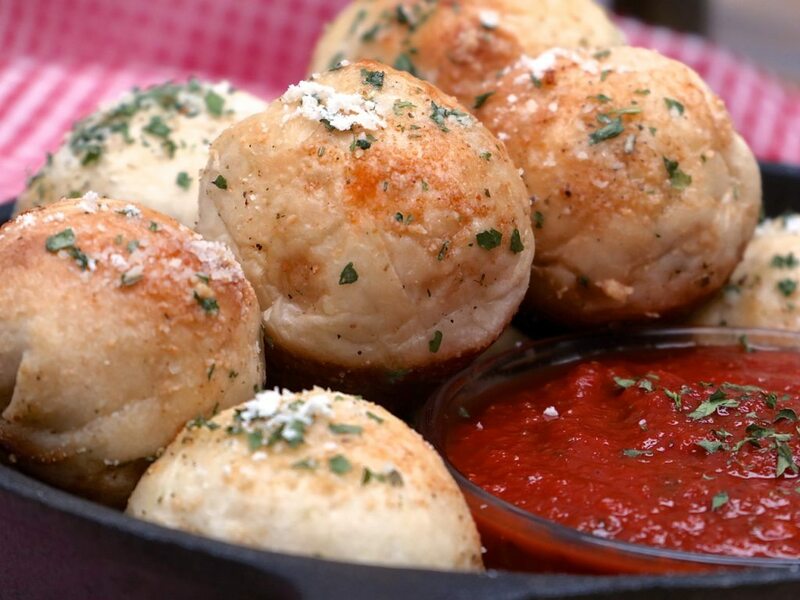 There is something fun about sinking your teeth into these soft, garlicky, cheesy bites and discovering what’s inside. They just can’t help announcing “Ohhhh I got BBQ chicken,” ” Yayyy I got my favorite, Pepperoni!” or even “yuck I got pineapple bacon!” to which my husband proudly accepts. For kicks I usually do one empty one and whoever gets it has to do the dishes. Don’t you just love it when mealtime is full of laughter and good conversation? I live for memorable meals like this. And in my opinion, the cheesier, the better! When I think about it, most of my family’s favorite recipes involve some form of dairy. What’s up with that? Whether it’s my buttery buttermilk biscuits with sausage gravy or Southern baked macaroni cheese, it’s clear that dairy foods are definitely where our cozy, comfort zone is. Even when I look back over my childhood, it’s funny that most of my most nostalgic, feel-good meals center around dairy. My Grandma Barb’s grilled cheese sandwiches on a rainy day, my mom’s homemade hot chocolate after playing in the snow and those from-scratch pancakes covered in buttermilk-maple syrup every Saturday morning. Ahhhh …I could go on and on. But let’s get back to these Surprise-Me Pizza Bites before I drift completely down happy food memory lane. 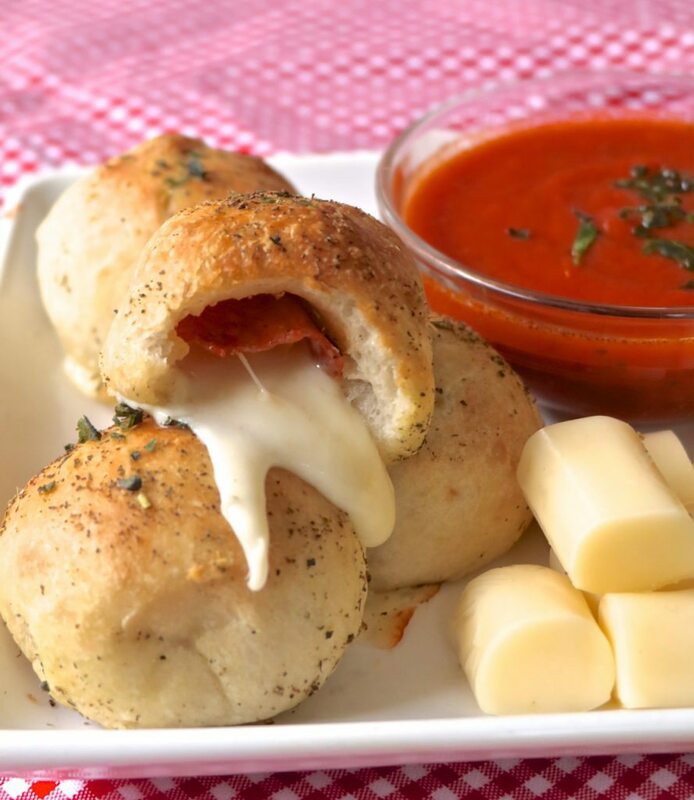 Do you wanna know what else I love about these pizza bites? I can use different types of cheeses!! Usually, when I make regular pizza, I stay on the safe side and just use mozzarella. 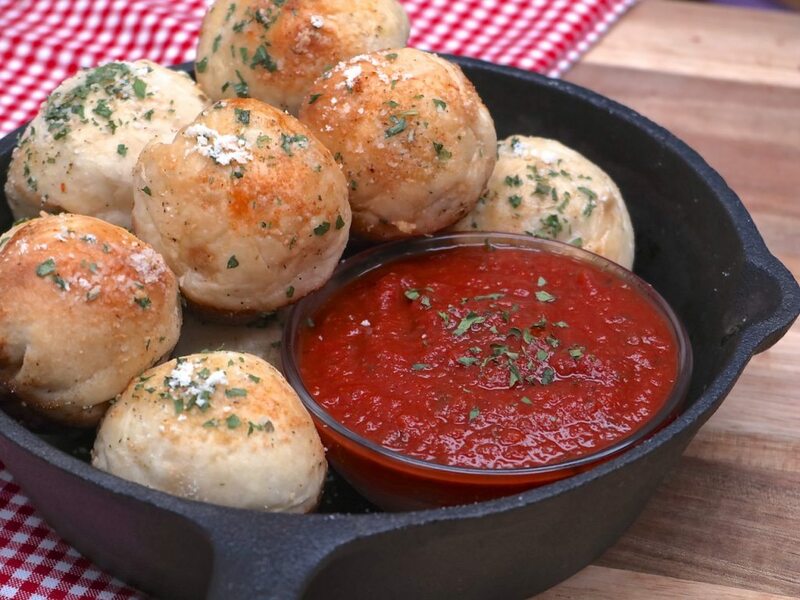 With these little pizza bites, I totally have the freedom of playing around with a variety like my favorite, Smoked Gouda! And just in case you need a few filling ideas, here are a few of our favorite flavor combinations! 1. Philly Cheesesteak: Provolone cheese, sliced roast beef lunchmeat, diced bell peppers, and onions. 2. Bacon Cheeseburger: American cheese, ground beef, bacon, onions, and pickles (yes pickles). 3. Hawaiian BBQ Chicken: Mozzarella cheese, bacon, pineapples, BBQ chicken, and red onions. 4. Veggie Lovers: Smoked Gouda cheese, bell peppers, onions, black olives, mushrooms and banana peppers. I usually stick with 3-4 different flavors. They’re easy to whip up, and since they are small, they don’t require much filling. Even if you decided to do one flavor, they are still amazing and fun to eat. Flatten out the dough ball into a 3-4 inch circle. Top with a cube of cheese. In a small bowl, stir together the butter, garlic powder, and Italian seasoning. Dip the balls of dough into the butter mixture and place 2 inches apart on the prepared baking sheet. Sprinkle the tops with parmesan cheese. Remove from oven when lightly golden on the top. Brush with butter and sprinkle with the parsley and more parmesan cheese. You'll only need about ½ -1 Tablespoon of filling per pizza bite. I chop everything up small and combine each flavor in a bowl so that I can just scoop it all instead of having to layer it one at a time) Make it so much easier and faster. 2. Bacon Cheeseburger: American cheese, ground beef, bacon, onions, pickles (yes pickles). 3. Hawaiian BBQ Chicken: Mozzarella cheese, bacon, pineapples, bbq chicken, onions. What cheesy flavor combination do you think would be good in these? Leave your comment below! I can’t wait to read them! I created this post with America’s Dairy Farm Families and Importers in partnership with the Innovation Center for U.S. Dairy, however, the views and opinions included are my own. Wow! This is a really cool, unique idea. Love it! Thank you so much for sharing…all of your recipes are amazing.